Download your copy now - only $31.95! Gary Friedman has earned a reputation for clear explanations and a ridiculous attention to detail. 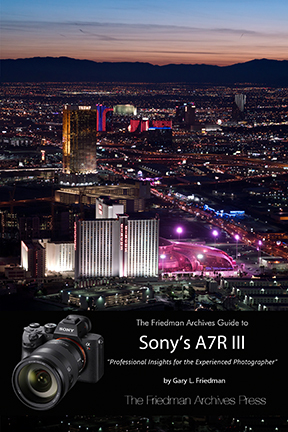 And his 700+ page, instantly-downloadable, full-color ebook on the A7R III doesn't disappoint! "Amazing work! Sony should really just hire you to be their manual writer-in-residence as their instructions (which I have side by side) are completely inadequate. It's clear you have an engineering background but are able to explain complex math very clearly. I also appreciate your contextual references to film days (like in your metering section) which explain why I've always been baffled by how unnecessary some features are. And your explanation of the software vs. hardware exposure compensation is priceless" - Toh Ne Win . "So far, this guide looks OUTSTANDING. I cannot believe you let this go for the price you do. It's incredible!" - Ferdinand Lucero Jr.